I recently salvaged a vacuum fluorescent display (VFD) from a piece of old test gear. The VFD is a 13 digit 7-segment multiplexed display and I thought it would look great in a custom digital clock or something similar. While it has the model number FUTABA 13-MT-54NA, I could not find any information on the internet specifically for this model. Of course, before I could put this vacuum fluorescent display to use in my final project, I needed to first build a driver circuit to drive this display. Unlike driving a multi-digit 7-segment LED display, driving a VFD is a little bit more complex due to the multiple voltages involved and the relative potential requirement for the filament. Of course there are many specialized chips we could use to build a VFD driver with, but like with many of my previous projects I love to build things from scratch so I thought I would build the filament driver and the VFD driver myself. Fortunately, we can generate this waveform by biasing the center tap of a pulse transformer above the ground and feeding a square wave through it. 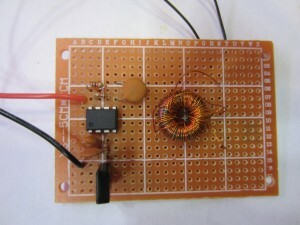 The following circuit design shows such a filament driver circuit using a 555 timer and a center-tapped transformer. The 555 timer is configured as an astable oscillator. Given the RC values chosen (1k, 4.7n), the operating frequency is right around 100 kHz. The diode across R1 ensures that the output waveform from pin 3 has a 50% duty cycle. The pulse transformer was hand-wound using a torroid core. Because the operating frequency is relatively high, only a few turns are needed for each winding as a result. In my case, I used 40 turns for the primary winding and two 15~20 turns for the secondary (depending on the voltage required for the filament). Using the values given, the measured RMS voltage across the filament is at around 2.2V. Because the center tap is tied to +5V, the filament potential will stay above ground level at all times and thus preventing electrons reaching the anode when the grid voltage is 0. This in turn eliminates the ghosting effect. Figuring out the actual pinout of the module is relatively easy. Since I couldn’t find it anywhere, I thought I would share the pinout information here. Also see A DIY Vacuum Fluorescent Display Driver. This is a great post. I have a module that is very similar, if not the exact same part number. It’s been sitting around for a couple years, never knew what to do with it, cause I didn’t know how to drive it. Can you give a bit more info on the coil? I’ve never wound one like this before; would I be able to use an off-the-self component? Do you know the voltage to drive the grids and the segments, are they just +5vdc? Sorry so many questions. I was just excited when I saw this. Regarding the coil, yes, in my case it’s roughly 4:3 (40 turn on primary and 2×15 on secondary). If you are not sure what the driving voltage is, you can play safe by trying 2:1 first, the 2:1 configuration will provide a filament voltage of roughly 1.5V RMS (assuming 50% duty cycle) which is safe for most of the VFDs. Anyway, I will post the entire working circuit soon. I’ve had success doing this with a 555 and a capacitor in series with the output. The effective resistance of the capacitor changes with the frequency. And I count 12 digits. There are 13 digits. The MI dot line and E on the rightmost is it’s own grid and is treated as a digit. Nice post Kerry. I lucked out and found a supply of LM9022 ICs that I’ve been playing with for various VFD glass modules. I didn’t have the knowledge to calculate the transformer turns. You’ve re-motivated me to learn more about home brew transformers. Thanks! This schematic is not working for me. I have wound the toroid 4:3 with center tap and one of the input leads connected to 5V. I have used TIP50 and MJE340 because I don’t have BD137. The problem is that after R3 the waveform looks bad and there’s about 500mV drop on that resistor. The transformer is good I have tested the continuity on all leads and they check out perfect. 555 outputs a nice waveform with 50% duty cycle at about 100kHz at 4.5V or so. So I don’t know if you’ve used that schematic in the end and it worked out, but for me it doesn’t work. Also the pcb picture does not reflect the schematic. There are two diodes missing from it and there’s an extra capacitor. Care to tell us exactly what worked for you? Also I’ve tried some smaller transistors, also with load on the other side of the transformer, and without load. I get on the output only some large spikes of about 30V or so but real short. This is the exact circuit I used in my VFD clock build (http://www.kerrywong.com/2013/07/01/vfd-clock-putting-everything-together/), The diodes are soldered on the reverse side of the PCB and the two caps are in parallel as I didn’t have the cap of the right value. Anyway, The waveform going into the base will look a bit weird as once the transistor starts to conduct the Vbe will be clamped at around 0.7V. Could you elaborate a bit more on what didn’t work? Once the circuit is working, you should be getting a voltage across the secondary winding. One thing to pay attention is the phase of the two halves of the windings, if you connected them the wrong way around, you wouldn’t get any output as the two opposite phases will be cancelling out. You can easily verify this by measuring the output voltage against the center tap. My issue was that after R3 signal was degraded real bad. Before R3 (at pin3 of 555) the signal was proper with no issues. I really didn’t think about the phase cancelation, will do some tests with the transformer. I already took it out from the breadboard but maybe will get to it tomorrow. I also removed the transformer and just used a resistive load for the transistor, same deal. Signal ok at pin 3 but completely gone after R3. It’s not gone, it’s just real small and only has some spikes here and there, no square wave. Looked at it with the oscilloscope. I have this VFD that I recovered from a Panasonic microwave oven, it’s a NEC fip6bm9r with no info online. I measured the filament supply before taking it out and it was 2.2VAC with 125mA (had a limiting resistor in series of 6.4ohm with 0.80V drop on it). Forgot to add that DMM showed 0.2VAC at transformer output, there were some large spikes of 20something V pretty far apart. average was almost nothing, plus I don’t know if it’s safe to send those spikes into the filaments. What you need to measure is the RMS voltage at the secondary, also it should be measured with a load similar to your filament (e.g. in your case a 18 Ohm resistor) and measure the RMS voltage across the resistor. Ok, I will give it another go tomorrow. On pin 3 of 555 there was ~ 100kHz signal with 50% duty cycle. The VFD is powered normally by sinewave AC. Now, square wave power has some other implications, like the power delivered by a square wave is double that of a sine wave for the same Vpp. Should I take that into consideration? And if so, do I only need 1.1Vpp square signal with 50% duty cycle? I measured with a DMM that has trueRMS. I messed up in the previous message. 2.2VAC RMS is about 6.2Vpp. I live in Europe so that was 50Hz. What would be the equivalent of that in square wave Vpp? I think I got it. So for a 50% duty cycle Vrms=Vp(1/sqrt2). So 2.2V=Vp*0.7071 where Vp is 3.1V. So I need a square wave of 3.1Vp with 50% duty cycle to simulate the same conditions for my VFD. Yep. That calculation is correct. Or you could just rely on the RMS reading of your meter. Ok, I tried it once more. I made the circuit all over again, I have used an isolated variable supply for 5V. I have used my Owon SDS6062 oscilloscope to measure everything. Having an isolated supply allowed me to measure the full output of the transformer. As a load I used 17.5ohms derived from series/parallel connected resistors. Seems ok, ~105KHz, 4.6V amplitude. 555 is configured and working. So far these measurements were made relative to ground. This is the full output of the transformer, this is what the VFD filament gets. Frequency is somewhere at about half the initial 100KHz. So as you see either way the output looks real bad and is in no way close to the 2.2V or so. Any ideas? Didi you happen to make it work like that precisely with BD139? Shouldn’t it work with other similar transistors? Any other routes I could try? Maybe opamps or? 2.2VAC with 125mA is about 0.275W which is low enough to be driven by an op-amp I guess. You were right, I did mess up the transformer. I decided to unwind the secondaries and wind them back carefully. After doing that it seems that the whole thing came around. So it looks good. Not quite as much as I’d wish but it’s almost there. I decided to light up a full segment to see what’s what and I needed to get another power supply, For 555 I used a breadboard card that’s 5V fixed. I used my lab variable supply for powering the segment. Last time when I used DC I could light up the segment with 5V. Now I needed about 11-12V to do that. I referenced my lab supply ground to 555 ground. Now I have a ghosting effect that’s real bad. Any way I can get rid of it? It appears almost immediately as the segment lights up, and it’s all over the other segments. Someone over at eevblog helped me by suggesting I connect the grids that are not powered to ground. That fixed the ghosting. Great. Yep, the filament is not ground referenced. 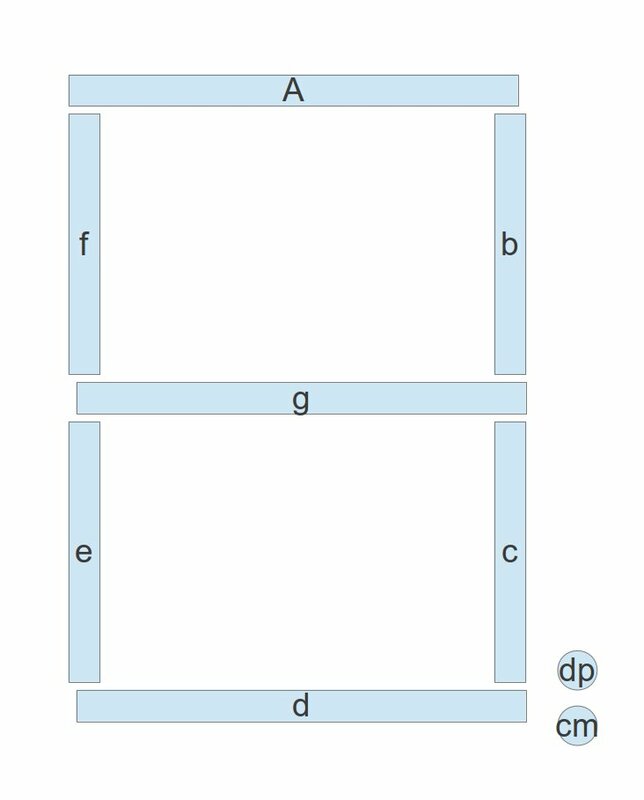 If you measure the two outputs from the secondary (referencing against ground) you will see that one is positive the other is negative. By the way, that is a very nice VFD you got there! I hope that my issues will help others that want to make this driver for VFD filaments. thank you for the interesting circuit! I salvaged some 16-segment by 20 characters VFDs and the related anode/grid driver ICs from boards that I picked up in a flea market, and I should like to work on them. I ask you help to let me understand how to conjugate your power supply with my drivers, because they work with negative voltages. The ICs are: 10941 and 10939 made by Rockwell (you can download the data sheet at this address: http://www.datasheetframe.com/PDF/10941-PDF/500306), one for grids and the other for segments. They very interesting because they incorporate the character generator logic. Vgg (“Display Voltage”) is at -45 V.
Logic pins from the host require pull-ups to Vss from TTL sources (logic “1” is at Vss); logic “0” is negative referenced to Vss or tied to Vdd. The filament supply is not described and so is the center tap. 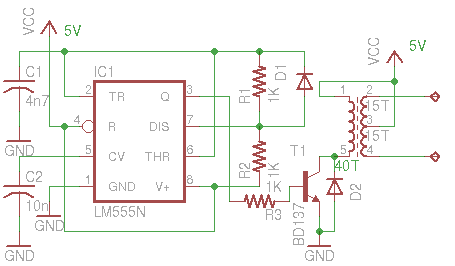 I guess that I have to connect the center tap of the transformer to Vss, and I feel that there is no problem interfacing with the host (I want to use Arduino) because the reference of the driver ICs is floating (am I right?). But I am not sure about the way to put the zener diode between the center tap (K) and ground (A), which is suggested to obtain cut-off bias voltage. As you can read from my post, I’m new to VFD circuit design and I should like to avoid damaging either the display or the ICs with an incorrect approach. It all depends on what the driving voltage on the grid is. To prevent ghosting, the filament bias needs to be above the the grid voltage when not displaying. The voltages specified in the link above are for the controller chips, it’s hard to tell what the driving voltage on the grid looks like. What is the size of the torroid? Most of the VFD filaments I have are 1.2 and 4.5 volts, 3 to 12 mA. Can this circuit handle the current? The torroid I used has an outer diameter of roughly 18 mm. And the magnetic wire’s diameter is 0.3mm. But you can choose from a wide range of parameters. This is awesome, thanks for the info! Using your diagram I built the filament driving circuit and it’s lighting the display just fine, but I’ve got a problem with current draw. I’m using a 3A power transistor but it gets REALLY hot. I don’t have a meter that can measure current or voltage at high frequency, however my coil only measures about 0.8 ohms on the primary side so at 5 volts I imagine it’s exceeding the transistor’s rating. What’s the intended impedance of the coil, and/or the current draw of this circuit? Could you try increase the operating frequency and see if the heat dissipation remains an issue? I am getting back into electronics after a long time away, and planning to experiment with multiple vintage display technologies and vintage clock chips (not planning on going Arduino of uC/real time clock yet). 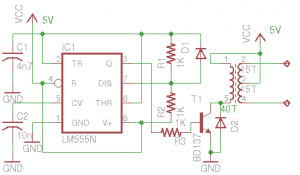 I *really* like the concept of your circuit for powering VFD filaments. Between not having to use a more bulky transformer, and the novelty/challenge of winding my own transformer, that is a plus. I will be using both discrete VFD tubes for digits, as well as a vintage VFD clock display tube – for a 4 or 6 digit configuration. Do you envision that your circuit would be capable of powering the filaments for all of these configurations, if I place the tubes in the discrete application in parallel? In my original VFD clock from 1978, I had the discrete tubes in parallel and four of them draw about 80mA at roughly 2V. It seems to me that your circuit would do it. I am planning to use the same driver transistor that you did. The most recent comment I found concerning – my hope would be that the power that this function consumes will not be more than say, the same as what the filaments consume. Excellent post, and I look forward to looking around your site more. it should be able to handle 2V 80mA. You can experiment with tuning the oscillation frequency to find the optimal operation condition as the efficiency of the converter is highly dependent on the material/windings of the pulse transformer.